CEREC is a superior method of creating precisely-designed, color-matched and highly durable ceramic restorations right in the dental office. CEREC allows you to avoid impression materials, temporaries, and multiple dental appointments usually associated with cosmetic dentistry cases. A CEREC restoration is convenient and healthy. Years ago, dentists could only use amalgam, gold, and other metals to fix decayed and damaged teeth. With CEREC, I can use strong, tooth-colored ceramic materials to restore your teeth to their natural strength and beauty. 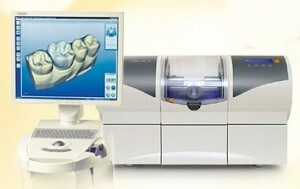 More than 20 million restorations have been performed worldwide using the CEREC technology. I am proud to be the first dental office in the Hurricane/Teays Valley area to offer the CEREC approach to tooth restoration. Call today to schedule an appointment or if you would like to learn more about single visit tooth restoration.